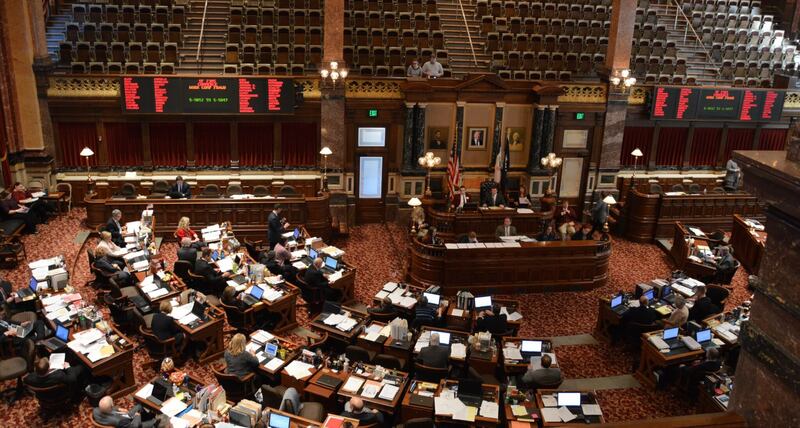 The recent 2018 election failed to end the Republicans trifecta lock on Iowa government. Democrats picked up several house seats, but remaining in the minority makes it extremely difficult to pass any progressive legislation in the next two years. Republicans will continue to control the legislative agenda. However, a 2018 exit poll suggests there are issues Democrats may be able to leverage based on voters’ answers on a variety of questions. The results of the poll suggest Iowa voters hold views much more in line with Democrats than Republicans. It validates Iowa voters support for many progressive policies even though they may have voted for Republicans. The exit poll commissioned by Progress Iowa was conducted November 6 and 7 by Public Policy Polling. They surveyed 646 Iowans. Among the results to 23 questions, it confirmed a majority of Iowa voters favor adequate education funding, returning Medicaid to state control and raising the minimum wage. View the full poll results here. The executive director of Progress Iowa Matt Sinovic pointed to the relevance and importance of this polling. The polling could be extremely useful in the upcoming legislative session since Democrats are more in tune with voters on these key issues than are Republicans. Democrats fear further attacks on a number of fronts. One of the Democrats’ main concerns about the upcoming session is a Republican attack on the Iowa Public Retirement System (IPERS). The Republican threat to IPERS is an attempt to move it away from a pension and into a 401k system. The voter polling on IPERS shows a significant majority of Iowa voters (69%) support maintaining it as a pension system. Democrats must remind Republicans that a majority of voters’ support IPERS in its present form. Several of the primary issues that the Hubbell campaign elevated and used to put Reynolds on defense will remain important to the public. The polling results clearly show majorities support the Hubbell positions on increasing education funding (57%) and returning Medicaid to state control (55%). Democrats have a majority of the voting publics’ support which should act as an advantage for Democrats in increasing the level of education funding. Likewise, Republicans may find it more difficult to refuse changes to a privatized Medicaid system that is supported by only (34%) of Iowa voters. Another area that has already seen some movement due to Hubbell’s’ campaign is women’s health care. Polling shows (54%) of Iowa voters support restoring Planned Parenthood funding. While there’s no expectation that Republicans will fund Planned Parenthood, Reynolds did yield slightly during the campaign by committing to support over-the-counter birth control. Republicans have also expressed some support for finally funding the 3/8 cent Iowa Natural Resources and Outdoor Recreation Trust Fund. Polling shows (73%) of Iowans want the governor and legislature to act on reducing farm pollution runoff. In a similar question, 66% of voters indicated they would prefer funding education, infrastructure and clean water rather than getting a decrease in their taxes. This voter exit polling suggests Democrats have the majority of Iowans supporting many of their policy positions. Democrats must leverage this public support in order to persuade Republicans to pass progressive legislation. At the very least, Democrats may be able to use this data to prevent even worse legislation from passing over the next two years. PREVIOUS POST Previous post: Who Will Run Against Joni Ernst In 2020? info of the patients and the survey should be done soon. Exit polling doesn’t really matter when a voter has a Democratic viewpoint and then votes for a Republican. Republicans can do as little or as much as they want with state government the next two years – just like the last two. I have to glumly agree with Bob Dole. If you don’t vote your opinions, your opinions will usually be ignored. And if you don’t do anything to express your opinions, more so. As a water-quality activist for decades, I shrug my shoulders at the 73% of exit-polled Iowans who said they’d like to see required farm pollution reduction. Only a small number of Iowans ever tell their legislators they want cleaner water, let alone better water policies. The well-funded Iowa Farm Bureau and its farmer members easily smash down every effort to pass water policies that would actually work. For them, it’s about keeping their money, a strong motive. In the DM REGISTER’s editorial today about nine issues the Iowa Legislature will need to address this year, water pollution wasn’t even listed. The feeble farce of a water bill passed last year is all we’ll have for the next two years. Actually, my last paragraph above was optimistic. Judging from what happened and what was attempted in 2017 and 2018, we’ll be lucky if state water policies aren’t weakened and made even worse during the next two years.